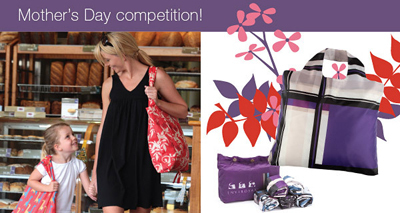 "Join any friend who is a Mom as a fan to the Envirosax Facebook page prior to Mother's Day and be in the draw to WIN a Candy pouch (set of 5 bags) for you and your friend! Simply message us with their facebook/myspace name and we will put you both in the draw. Competition open until May 10, 2009. Drawn after Mother's Day." Simple enough. And the Candy bags are pretty nice! I actually have plenty of sacks. Too bad the drawing isn't for that little black dress... now that I could use!